Key difference: Straw is dried stalks of grain that are left over after the grains have been harvested. Hay is grass that has been specially grown, been mown and dried for use. Both Straw and Hay often look similar and are even used for similar things. In fact, ask a layman and they’ll probably say that they are the same thing. However, that is not the case. While they may be similar in nature, they are two completely different things. Straw is dried stalks of grain that are left over after the grains have been harvested. It is primarily used as fodder or as material for thatching, packing, or weaving. Hay, on the other hand, is grass that has been grown, then mown and dried. It is primarily used as fodder. 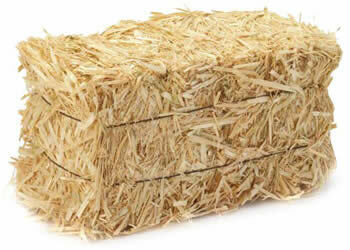 Straw is leftover resource that is utilized rather than be wasted, whereas hay is specifically grown for its use. Additionally, hay is primarily used as fodder for cattle and other livestock, whereas straw has a variety of uses. It is also often used as fodder, but can also be used as material for thatching, packing, or weaving. Both straw and hay are also commonly used as mulch to cover the ground. Mulch is necessary to conserve moisture in the ground, as well as to improve the fertility and health of the soil. It also helps to reduce the growth of weed. The main difference between straw and hay is that hay is the actual product, whereas straw is a by-product that is leftover after its main purpose is done. As it is a by-product it is much less nutritious than hay, which is why hay is more preferred as fodder, i.e. food for livestock. Straw is only used to supplement their food if they require more fiber in their diet. Also, straw tend to drier and more coarse than hay, which is why is often more versatile than hay. Hay is primarily only used as fodder, whereas straw can be used for a multitude of tasks, primarily for thatching, packing, or weaving. 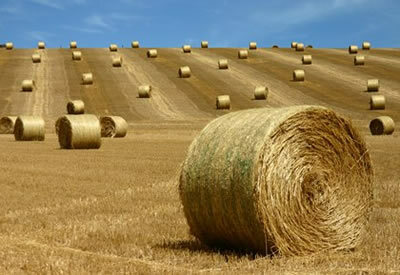 Hay and straw is also commonly used as mulch, but straw is better suited for this task than hay. The reason behind this is the fact that hay is grass; hence it often contains seeds which tend to grow when it is used as mulch, as it comes into contact with soil and water. The seeds from straw are often removed as they are the main product. The straw is what is left. Hence, the growing of seeds is not much of an issue here. Fodder, mulch, bedding, material for thatching, packing, weaving, etc. It is gathered and stored in a straw bale, which is a bundle of straw tightly bound with twine or wore. Can be stored as small square hay bales, large round bales, or stacked in hay stacks. Can also be stored in a wrapped in a bale wrapper as a silage bale.